These gift vouchers for fully catered Gold Coast sailing cruises offer private yacht charters which are the ideal way to experience a relaxing few hours sharing high quality food and refreshing champagne either at lunch or in the evening. A romantic way for couples to spend an enthralling getaway together as they admire the Surfers Paradise skyline, the pure blue waters of the Gold Coast ocean and the lush greenery of the mountainous hinterland. 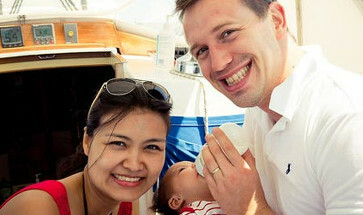 The charter boat service is first-rate and five-star, and the refreshments served will tantalise your tastebuds. A wonderfully fulfilling experience for couples regardless of whether you choose to seize the day - or night! 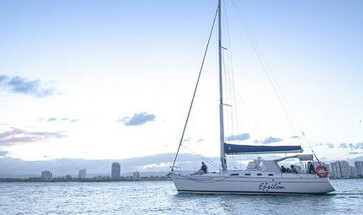 A delightfully relaxing experience, this gift voucher for a 2 hour sailing cruise will give you a taste of the beautiful ocean surrounding the Gold Coast. A wonderful gift that includes either a lunch or sunset dinner Gold Coast sailing cruise with a tasty, fresh lunch or dinner and complimentary champagne! This is a gift voucher for the romantic couple. 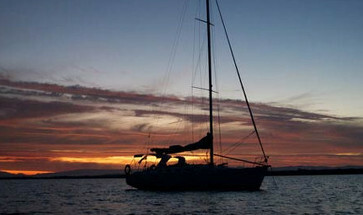 Exclusive use of a sailing boat on the spectacular Gold Coast Broadwater with a delicious lunch or dinner.